This recipe is a quick and flavorful way to use up an otherwise unassuming gourd. Simply baked with a slathering of marinara sauce, a sprinkling of cheese, and topped with crispy toasted garlic breadcrumbs (perhaps the best part of the entire thing). 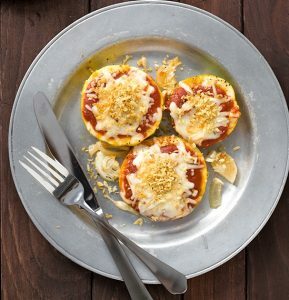 It’s like a deconstructed eggplant parmesan… but with squash (although you could very well use eggplant, or even zucchini or any other squash for that matter. So much of what we cook is out of pure necessity, and this recipe is no exception. From a drawer full of squash, a half jar of unused marinara sauce, and a wedge of forgotten cheese, and suddenly we had a delicious and satisfying dinner. A dinner we enjoyed so much, in fact, that we’ve made it twice already this season. Preheat oven to 400ºF. Line a large baking sheet with aluminum foil; brush with oil. Toss squash and onion slices with 2 tablespoons olive oil, salt, and pepper. Arrange in a single layer on prepared baking sheet. Spoon marinara sauce over squash slices. Bake for 15 to 18 minutes (depending on the thickness of the squash); sprinkle with cheeses and bake for 5 to 7 minutes more, or until squash is tender and cheese is melted and beginning to brown. Meanwhile, to prepare garlic breadcrumbs, heat 2 tablespoons olive oil and garlic in a medium skillet over medium heat, until oil is hot and garlic is fragrant, 2 to 3 minutes. Add bread crumbs, herbs, and salt and pepper and stir until breadcrumbs are golden brown, about 8 to 10 minutes more. Sprinkle breadcrumbs over squash slices and serve.